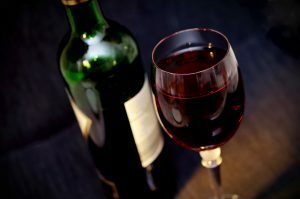 Red wine spills result in absorbed types of stains that are reddish or purplish in color and contain alcohol, sugar, tannin, and various coloring agents. 1. Apply cool detergent solution, blot. 2. Apply ammonia solution, blot. 3. Apply vinegar solution, blot. 4. Apply enzyme detergent, blot. 6. Apply dry cleaning solvent, blot.